The World Series shifted across the Bay to San Francisco for Game 3. But just moments before the game was scheduled to start, a major earthquake shook Candlestick Park. The stadium suffered only minor damage, but elsewhere the area suffered billions of dollars of damage, and dozens of people were killed. Commissioner of Baseball Fay Vincent immediately postponed Game 3, and delayed announcing when, where, and even if the Series would be resumed. Finally, after consulting with public officials, Vincent scheduled Game 3 at Candlestick Park on October 27, 10 days after the earthquake. The break didn't help the Giants. Dave Henderson stroked a two-run double in the first inning, and later clouted solo homers in both the fourth and fifth innings. Jose Canseco blasted a three-run shot just before Henderson's second homer, and the rout was on. By the time the Giants batted in the ninth, they trailed 13-3, and their four runs that frame were much too little, much too late. Game 4 was more of the same, as the A's pounded Giant pitchers early, taking an 8-0 lead, leaving the Giants to attempt another (futile) comeback. 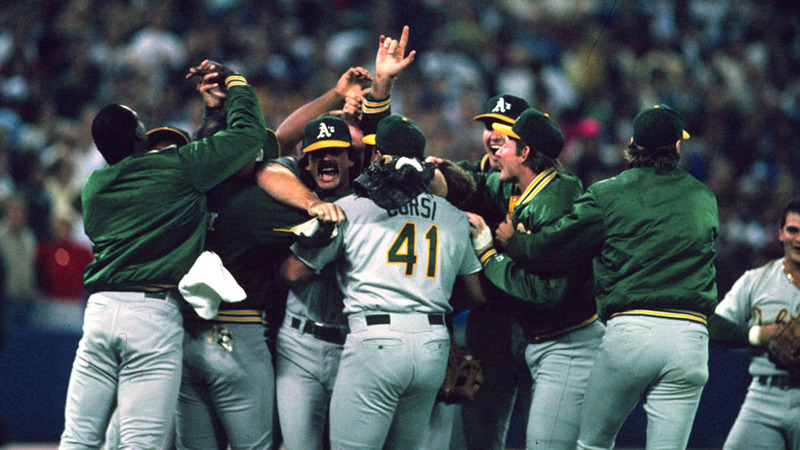 Trailing 9-6 in the ninth, the San Francisco hitters went down meekly before A's superstar closer Dennis Eckersley, and the Athletics were champions thanks to an impressive though tragedy-marred sweep.